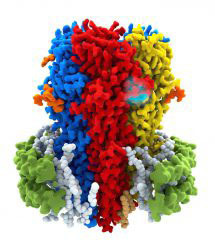 Cryo-EM structure of a human GABAA receptor (Laverty et al, 2019; Masiulis et al, 2019). Neuronal circuits are the biological substrates for all aspects of brain function such as learning, memory, thought, speech and consciousness. The synapses, connecting points between neurons, are continuously remodelled in response to novel experiences and hold the key to understanding how these circuits work. Little is known, however, about the fine structure of synapses. Increasingly long lists of molecular components are available and we know how some of these look in atomic detail, typically in isolation. However, these players do not work alone. They must come together and coordinate to make a functional synapse. We employ a combination of structural biology methods, including X-ray crystallography, electron cryo-microscopy and tomography, to define in high-resolution the architecture of neurotransmitter receptors, their supra-molecular assemblies and, eventually, whole synapses. We aim to link structural work with neuronal physiology, in order to provide fundamental mechanistic insights into the basic biology of neurotransmission. This work is also relevant for medicine. Normal human ageing as well as the majority of psychiatric and neurological disorders, from mental retardation and autism to Alzheimer's disease and addiction, are caused by errors in synaptic signalling and reduction in synapse numbers. We aim to use structural information to devise molecular tools that can help repair damaged synapses and restore their physiological function. Cryo-EM structure of the human α1β3γ2 GABAA receptor in a lipid bilayer. Structural mechanism for modulation of synaptic neuroligin-neurexin signalling by MDGA proteins. Crystal structure of a human GABAA receptor.